I can’t think of anything more comforting than a bowl of soup. Warm, filling, and nourishing, homemade soup feels like a big hug. 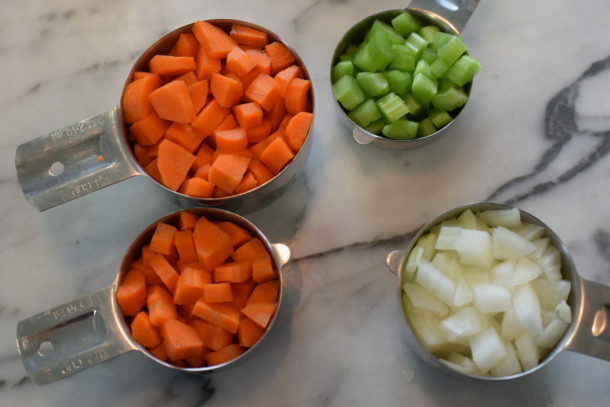 My husband and my kids (especially Mr. Picky) all love soup and I love making it because it’s easy, flexible and soup makes great leftovers. 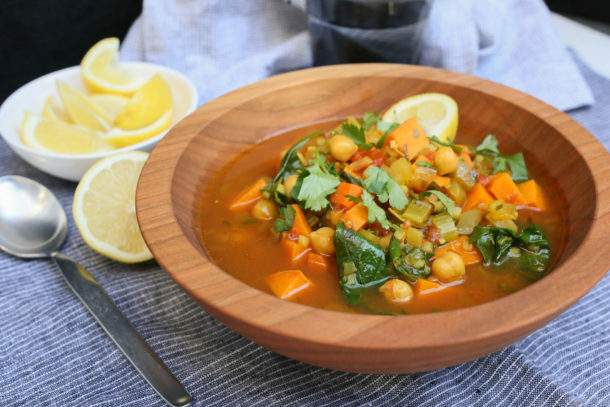 I originally developed a Moroccan chicken and vegetable soup for Clean Eating Magazine’s January 2017 issue and I then tweaked it for a vegan version. 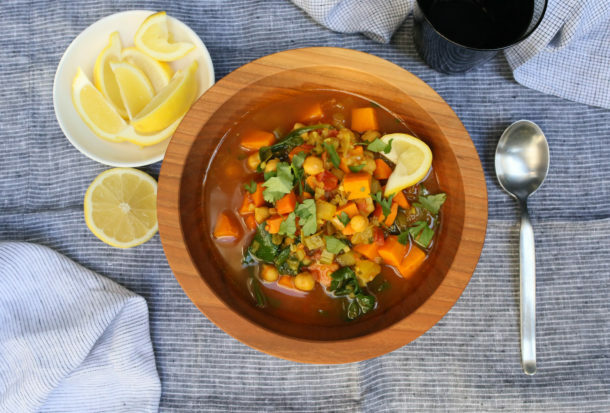 The recipe in Clean Eating (which can be found here) is a hearty soup with shredded chicken, loads of vegetables, including sweet potatoes, and fragrant Moroccan spices. It is topped with crunchy, oven-dried chickpeas for a satisfying crunch. It’s one of the most flavorful and gorgeous soups I ever developed. I decided to teach the soup in my classes last fall and I already had a recipe with animal protein on the menu, so I vegan-ized the soup. I took out the chicken and replaced it with cooked chickpeas, added a little cinnamon and some cauliflower rice for extra body. Everyone went crazy for it! This is a very anti-inflammatory soup from the veggies to the spices, a real bowl of goodness. I have even eaten it the next day for breakfast — soup is one of my favorite ways to start the day. Don’t skip the lemon and fresh herbs if you have them on hand. They add an extra special boost of flavor. If you are in California like I am, and the rain and dampness are getting you down, make yourself and your loved ones a pot of this and all will be well in the world. 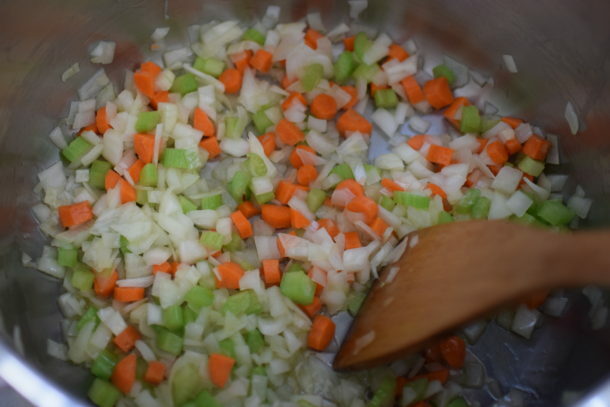 Heat the oil in a medium stockpot and add the onion, celery, and carrot and cook until tender, about 6 minutes. Add the turmeric, cinnamon, ginger, cumin and black pepper and cook for 1 minute, stirring constantly to prevent scorching. Add the tomatoes with the juice, and sea salt. Cook until fragrant, about 2 minutes. Add the stock and sweet potato and bring to a boil. 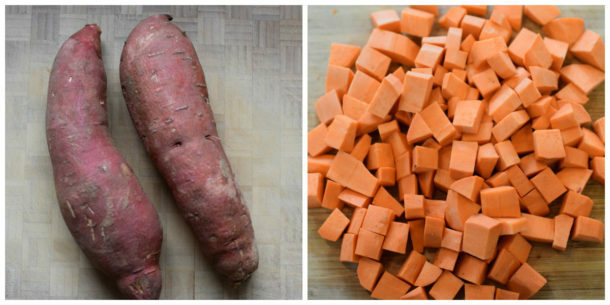 Reduce heat to low and simmer, covered for 20-25 minutes, until sweet potato is tender. Add chickpeas, cauli-rice, cilantro and parsley and cook until cauli-rice is tender, about 5 minutes. Add additional stock if you want it thinner. Stir in spinach leaves. Serve with a wedge of lemon for squeezing over each portion. I made this for a book club party. The women went crazy for it. They kept asking me, what is this recipe, I have to have it. Thanks Pamela! Nicely done, Lisa!!! And thanks for making me look good LOL! Thoughts on freezing this? I know potatoes don’t usually freeze well. Have you eve4 made this with a different kind of bean? I haven’t but you can if you like. I think white beans or pinto beans would work well. OMG! This is now my new favorite soup! Used white navy beans and also added toasted pumpkin seeds on top and avo. Yum! Perfect! I love those subs, yum! I have both fresh and ground ginger. Do you recommend using the fresh instead? If so, what would be the equivalent amount? Ground ginger is what I used for this recipe, but if you have fresh, you can use it for sure. You can try 1 Tablespoon of peeled fresh ginger, grated. I haven’t tested the recipe with fresh ginger so I don’t know exactly what measurement would be the best, but you can wing it. If I’m making cauli-rice at home for this soup, do I sautee and steam it before putting it in the soup or just put in the raw, riced cauliflower? Thanks! Just put in the raw, riced cauliflower — much easier. Cook the soup until the riced cauliflower is tender. Thank you so very much for sharing my recipes and my site with others. You have no idea how much I appreciate that! You are so welcome! I am not a crazy person but I do tell anyone who will listen about your website. Especially if I am in the grocery store and they have picked up an item that I have used in one of your recipes. Say, brussel sprouts. I ask them if they have eaten them raw and then I tell them about that delicious salad with the apples and the (devil) mancheco cheese. My mom jokingly says I have become a food snob since I have been reading your blog and I happily am. 🙂 I feel like I have become a better cook. So, thank you. What a delicious recipe. I tried it yesterday to impress my in-laws and it worked! Everybody loved it! Thank you so much for sharing the recipe! I totally forgot the cauli-rice (still sitting in my fridge) but the soup was delicious anyway. Thank you for the recipe! Good to hear you enjoyed it anyway! I made this for dinner for my family tonight and it was a hit! My husband said it was now his favorite soup. I’ll be making this one over and over again. So easy, super healthy and delicious, yum! My question is not about the soup – my almost 4 year old granddaughter asked me to make strawberry cupcakes for her birthday party. The recipes online were very disappointing. I love your muffins and make them all the time. Any suggestions for strawberry cupcakes/muffins for a child’s party? Any and all suggestions are welcome. Does she want pink cupcakes or white cupcakes with chunks of strawberries in them?